It's everywhere. Every hack creator on the planet is now jamming this shot into film, TV, and even video games (just watched an EA demo with it). Like the Wilhelm Scream and the iconic image of Arthur Rothstein's sun-bleached cow skull, it is part of our landscape. 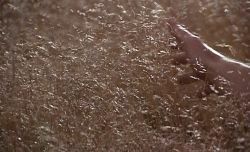 What made the shot work in Gladiator was that the hand touching the wheat was symbolic, it was memory touching the past. This symbol was charged by Scott's competence as a visualist and the music which accompanied it. It was an earned moment. It was meaningful. Now it is a hollow feature of the cinematic landscape, a bleached skull reminding us of better films while desperately trying to cash in what's left of the image's resonance. When you watch Singularity on Netflix (or better yet, don't watch it), you will be subjected to this shot as a disjointed feature of a pastiche of every sci-fi film of the last thirty years. For the love of all that is good, this shot needs to rest. I wasn't aware it was that prevalent. The only other time I remember seeing it was this (or the previous) week's episode of Westworld. Counting the one you mentioned that makes three. But yeah, it is such a well known scene that you have to wonder why anyone would choose to use it. Pretty sure Days of Heaven did it before Gladiator did. Shieldmaiden wrote: Pretty sure Days of Heaven did it before Gladiator did. Did it, though? I remember a lot of shots of characters moving through wheat (and a lot of shots of characters moving through tall grass in Malick's The Thin Red Line), but I can't recall any time before Gladiator that he included shots isolating the hands running through said wheat, which I think is the specific visual cliche being pointed out here. Sure, shoot whatever you want in wheat. Just find a better way to shoot it. In the list of things that bother me from current Hollywood, this is probably #1,048,576. Not only modern superhero films. Similar shots can be seen on Independence Day, Ghostbusters, Lord of the Rings, and Raiders of the Lost Ark. BL wrote: Did it, though? I remember a lot of shots of characters moving through wheat (and a lot of shots of characters moving through tall grass in Malick's The Thin Red Line), but I can't recall any time before Gladiator that he included shots isolating the hands running through said wheat, which I think is the specific visual cliche being pointed out here. Sure, shoot whatever you want in wheat. Just find a better way to shoot it. It's been a while since I've seen it, but I thought so. And before I posted that I did a quick search and found this. Now, maybe that's a misleading screencap, I don't know. Guess what I just found. 1969. Shieldmaiden wrote: Guess what I just found. 1969. Jinnistan wrote: There it is. Robot Chicken lampooning the shot.